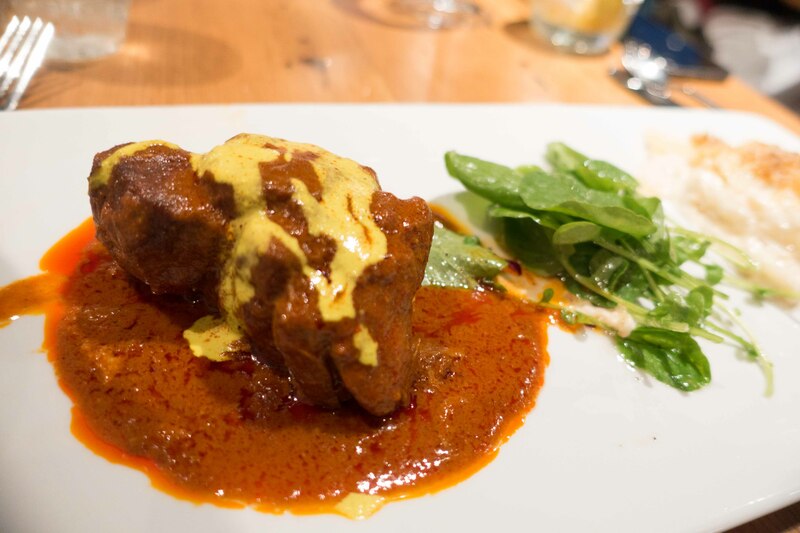 Wednesday night, Gail and I tried a new restaurant that’s gotten great reviews, Parada. It’s a Peruvian joint, owned by a guy who has 4 other successful Peruvian places around the Bay Area. Situated next to the Pleasant Hill BART station, it’s close, has great parking and big reviews. What more could I ask? We got there, and the place was packed. There are tables inside and out, and they were almost all full. The father and daughter in front of us in line did not have a reservation and were promptly seated at the last available table; I had a reservation and we had to wait. I wasn’t amused. But they seated us in a couple of minutes. The indoor area is LOUD. This is a clear design choice–concrete floors, open kitchen, metal chairs, no linen and very loud pulsing music–except it isn’t really music, just an incessant beat without melody. People shouting to be heard, the ball game on the television, clattering plates and silver, Parada is an aural assault. And there we sat. 10 minutes later the waiter came over to take drink orders. The menu is an enchantment. Two pages of things you don’t recognize, but they all sound great. 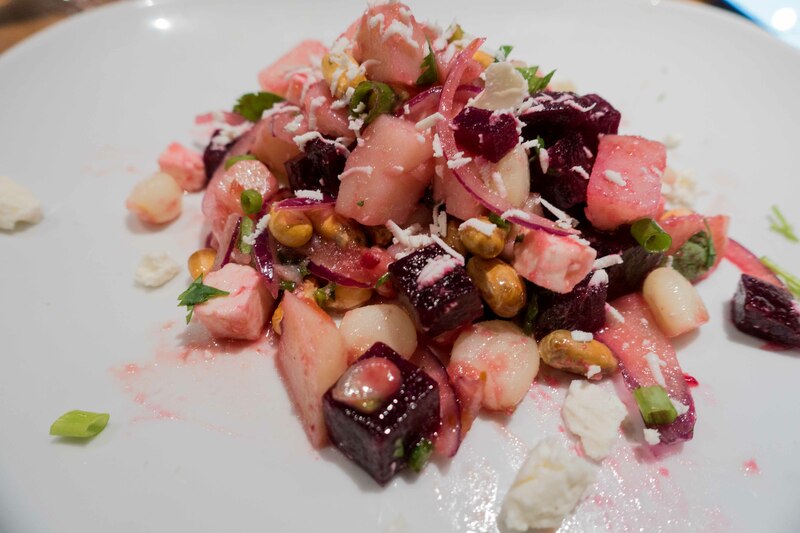 Ceviche plays a big part of the Peruvian cuisine, and is proudly featured. 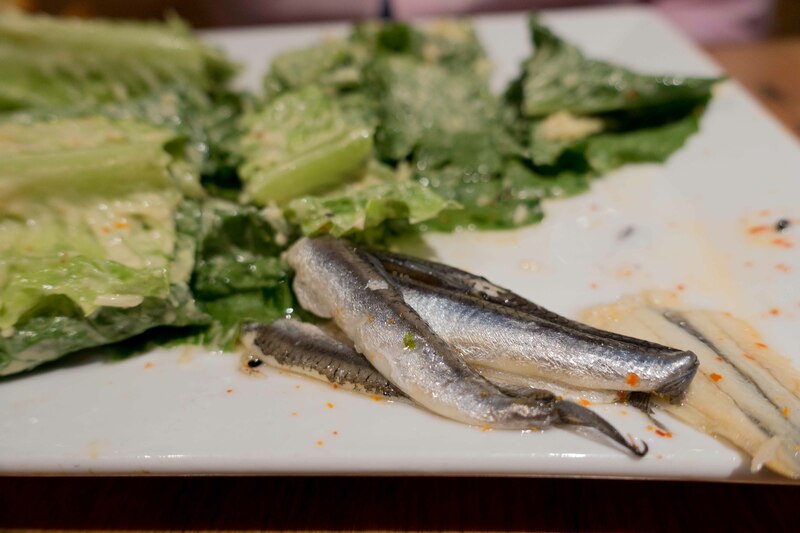 Gail had the Cesar (their spelling) salad, and looked on happily as she saw the two large anchovies on the plate. The dressing was excellent, although the ‘garlic butter brioche croutons’ were huge chunks of stale bread too hard to cut and too large to eat. 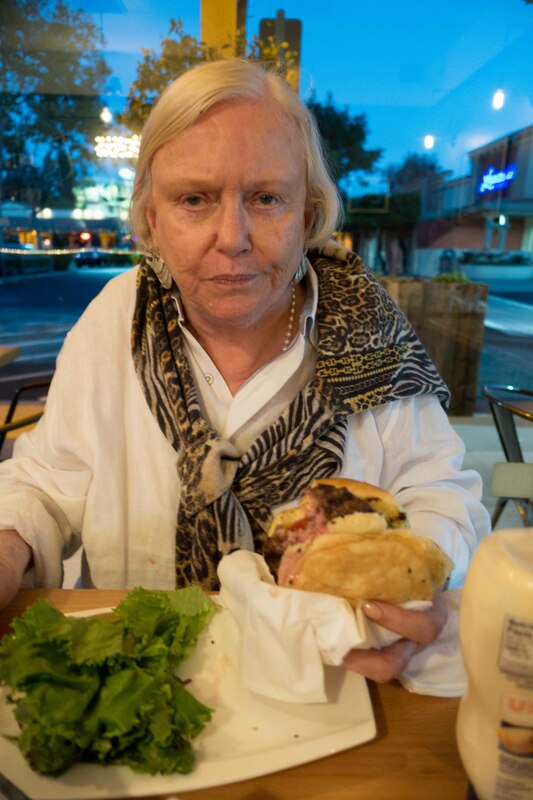 Nonetheless, Gail said it was the best Cesar she had enjoyed in months. I decided to grow up and order the beet salad. It turned out to be the right night to be an adult. The use the Latin American corn with the huge white kernels. This salad was unlike any I’d ever had before, and was certainly something I would order again. My idea of beets has always been the awful purple circles that came out of a can, but it’s time to get past that and understand that fresh roasted beets are something completely different than Mother served 60 years ago. My entreé was the Adobo 21. I don’t think there were 20 other Adobos. It was a succulent piece of slow roasted pork shoulder. 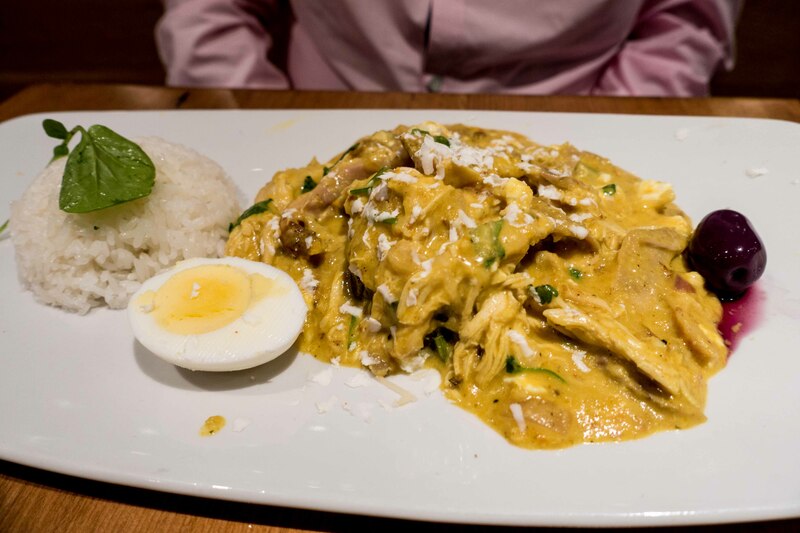 Gail ordered the Aji de Gallina, a chicken stew with Aji peppers. It was fantastic. Delectable. Savory. Just plain wonderful. The meal wasn’t perfect. I ordered the sauteed spinach, and it never came. Nobody refilled my iced tea. The service in general wasn’t very good, but I decided to cut them some slack because they were obviously slammed–every table was full. We liked the place so much that we went back tonight. Big mistake. There were a few empty tables, but the noise level was still extraordinary. Our waiter showed up, but seemed to be poorly trained. Gail asked for a ‘buttery’ chardonnay and he had to go ask which one to sell her. Gail ordered exactly the same thing as Wednesday. I ordered a quinoa salad, the daily ceviche and a potato appetizer. The waiter started to tell us how the food would come to the table as it came out of the kitchen, and I made it clear we expected our meals together. Appetizer, two salads, two entreés. This business of serving at the convenience of the kitchen is good for them but stupid for the diner. Our salads came. They were good. The place was busy. There was a crowd of waitstaff around the kitchen waiting for plates. We didn’t get any. We saw what appeared to be a manager. Told him we came to eat dinner together, and wanted our food. NOW. He brought the appetizer. Gail just lost it. She rather forcefully expressed that she wanted her dinner. NOW!!! More nothing. Still lots of people at the delivery end of the kitchen, waiting. Incensed, enraged, frustrated, angry and hungry, we got up and walked out, my ceviche and the potato appetizer untouched. This kind of service is a disaster for any decent restaurant. Gail’s stew was made this afternoon–all they had to do was put it on a plate with a scoop of rice, and they couldn’t manage that simple task. We went to Mona’s, and had a really good burger. Parada has excellent food, but completely lacks the capacity to get it to the table. Go there at your own risk, we won’t be back.